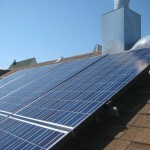 The Top 16 Savings and Advantages of Solar Energy How much is your solar investment worth? What are the true benefits of solar powered roofs for your home or office? As a leader with over 450 installations in San Francisco over the past three years, Skytech Solar has compiled this list of advantages of solar energy. 1) Protection from rising electric rates: By owning and generating your own power, you will no longer be subject to utility rate hikes. 2) Lower electrical bills: During daylight hours, your electric meter will feed clean solar power to the PG&E grid with solar energy credits; during the night hours, you will take power from the grid with Net Metering. This means cheap solar power. In fact, PG&E will credit your bill for the solar energy you produced for them and you will see a reduced electrical bill of at least 40-80%, depending on your current usage. 3) Increased property value: Using conservative estimates, one of the major solar benefits of a PV system is that it will increase your Year 1 property value by approximately $18,000 per unit. 4) A long lifetime with low maintenance: Solar power systems are warranted for 25 years, and require only occasional rinsing to clear dust and obstructions. 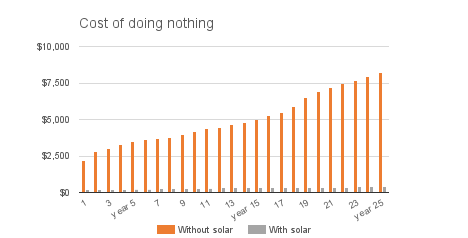 That’s just one more benefit of solar energy that pays long-term residuals. 5) Environmentally responsible: By making a solar investment in PV panels, you’ll be doing your part to combat global warming, while actually lowering your dependence on foreign oil and gas. 6) Sustainable and renewable: Among all solar power benefits, a simple solar power fact is that the sun is a 100% free, sustainable, infinite energy source. As a natural source of power, we will never run out of it or use it up to refuel our vehicles, to heat our water or to light our homes. 7) Solar energy credits can get you “off the grid”: With the right-sized solar panel system, you can generate potentially enough electricity to live off grid. This enables you to be independent of public utilities and not pay for any power. 8) Solar power benefits from silence: Unlike other sources of energy, there is absolutely no noise made from photovoltaic panels as they convert sunlight into usable electricity for your home or business. 9) An unobtrusive solar investment: Solar electricity generated from your solar power system attached to your rooftop is unobtrusive. 10) Solar benefits from government rebates: Many local, state and federal governments offer generous rebates and monetary incentives to install solar panels as well as solar hot water systems. 11) Earn solar energy credits: If you produce more solar electricity than you use, you can sell it back to your utility company for electricity credits. 12) Produce electricity day and night: One of the other advantages of solar energy from large solar power plants, such as thermal solar power farms, which can produce electricity whether the sun is shining or not, making it a reliable electricity producer. These power producers can store the heat generated during the day and use it when the sun isn’t shining. 13) Solar technology is evolving: The advancements in technology used to create solar energy continue to improve, making it more cost effective for more people to take advantage of the benefits for solar energy. 14) Clean energy with zero emissions: Personal solar panels for your home or business are friendly to the environment, producing solar benefits with clean energy with zero emissions, no greenhouse gases, smoke or any other chemical by-product. 15) Decentralized energy: While some areas get more benefits of solar than others because of more sunlight during the day, solar energy offers a decentralization of power. No oil, gas or coal needs to be transported to produce it. 16) Create solar jobs: Skytech Solar and other solar electric companies who are solar panel installers are creating solar jobs in the San Francisco Bay Area. In the European solar industry, the EIAA estimates that 100,000 jobs have been created.